RyuGin was close to the top of my list of restaurants to try in Tokyo. 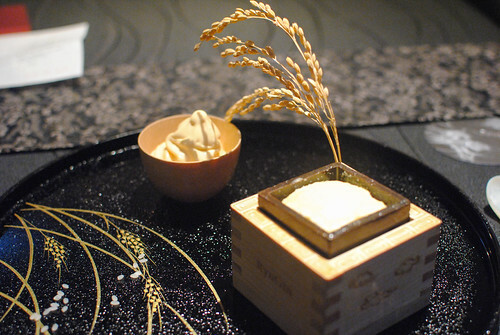 The modern kaiseki restaurant garnered three Michelin stars in the 2012 guide and is ranked #28 on the 2012 World’s 50 Best Restaurants list (while I don’t really believe in this list, it’s hard to ignore). In addition, I feel like everything I’ve read about the restaurant has been nothing but positive. 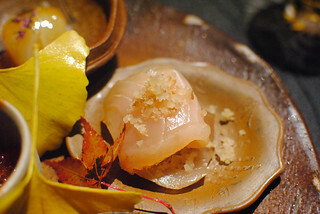 Chef Seiji Yamamoto blends traditional Japanese kaiseki with modern Western influences. 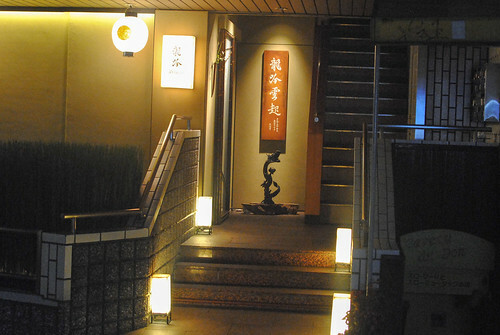 While an a la carte menu is available (after 9pm), diners are steered towards the tasting menu aka “Gastronomy Menu.” Priced at ¥23,000, it contains around 11 courses (though many of the courses have multiple components). Given its accolades from the Western world, the restaurant seemed well-equipped to accommodate customers from around the world. 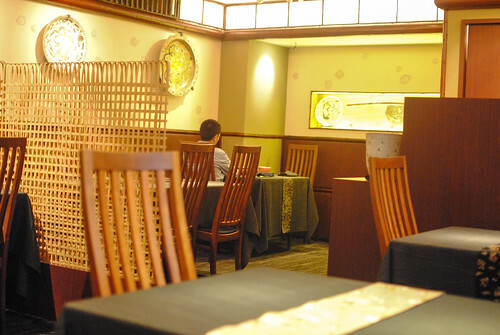 While there was Japanese spoken at some tables, English appeared to be the dominant language in the dining room. One neighboring table was even communicating seamlessly in French. While all of this often calls into question the authenticity of a meal in Japan, I’m confident that the food at RyuGin maintains its hold on its Japanese roots. 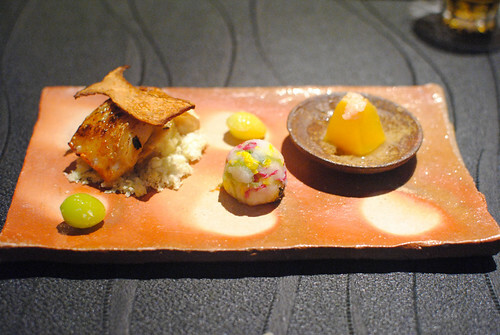 As with any kaiseki menu, the food is highly seasonal and local, with a focus on the artistry of the whole plate (the Japanese have been doing it way before it became cool to do so in America). The server said there were 12 different vegetables in the dish from whatever was found at the market. 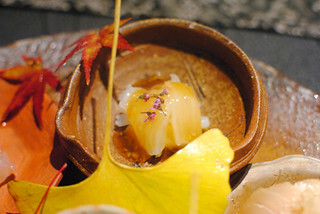 I could detect various mushrooms, bean sprouts and mushrooms in the texturally-dynamic dish. To bring it all together, it was dressed with a tasty pureed pine nut vinaigrette. I thought it was a very well-balanced first course. 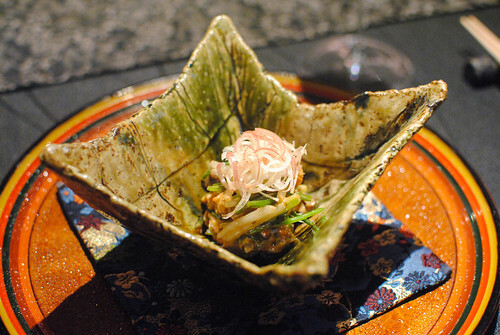 Next was a duo of abalone, presented in-shell. 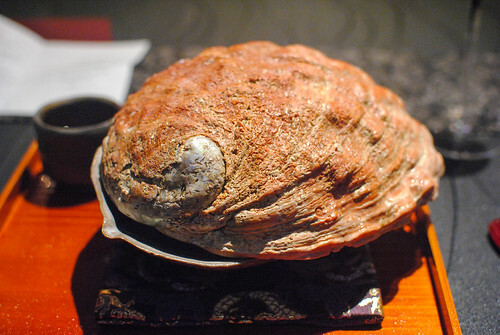 The abalone, apparently simmered for 10 hours, was tender with just a little bit of chew – delish! 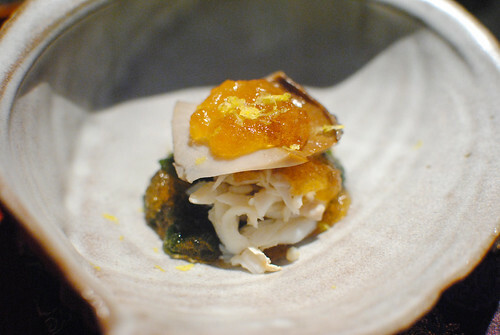 Blue crab completed the shellfish tandem, while an apple vinegar jelly provided some bright acidity. 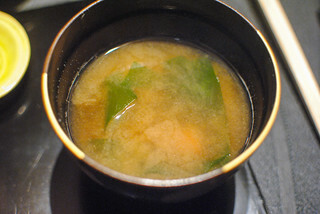 To subsequently wash it down, the chef served a comforting soup made from the same abalone. Next, this was quite a sight. Uni and seaweed were fried rare in some type of light rice flour batter. 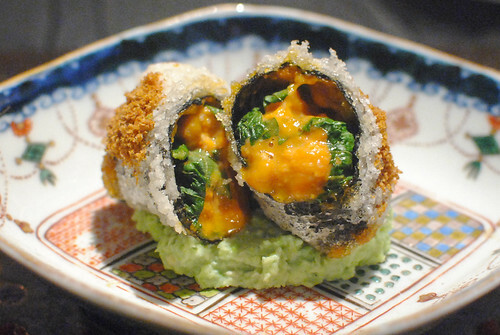 It was as good as it looked, with a delicate crunch and warm, oozing uni on the inside. So good! 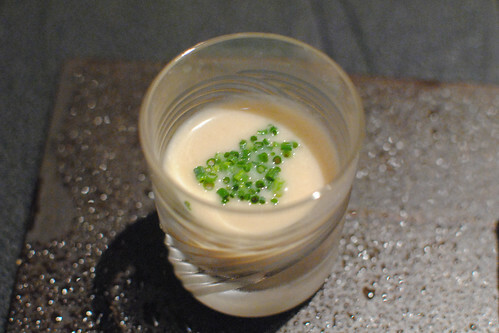 A cool mushroom soup provided an earthy contrast which was also quite nice. 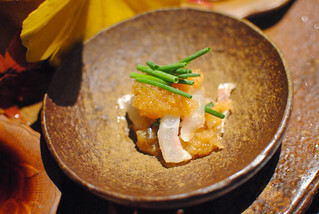 A very moist, light piece of sea perch sat in a bowl of dashi. I was worried the fish would overcook in the soup, but that wasn’t the case at all. 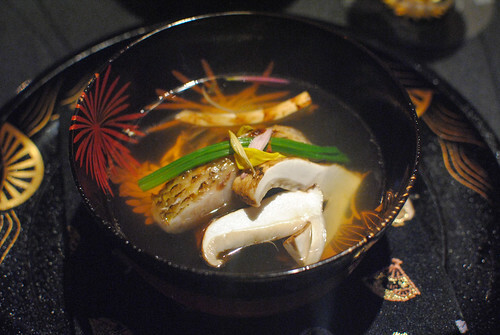 The fish was delicious, as were the tender slivers of matsutake, while a dashi broth brought a soul-satisfying warmth to the dish. 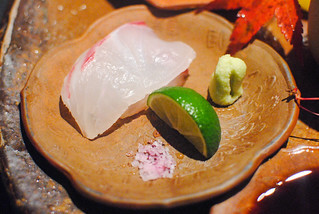 The assortment included squid, spanish mackerel, two sea bream preparations, a type of shrimp (ebi), and a cup of ikura with autumn vegetables. These were all pretty good, with the most interesting being the spanish mackerel with a smoked hay condiment providing a ton of depth. 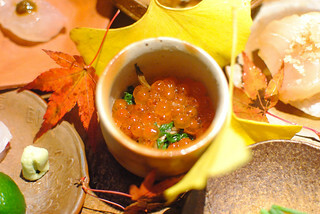 My favorite was probably the salty ikura with earthy mushrooms and greens. Next was this plate with a grilled white fish and thinly sliced fried mushroom. The fish was perfectly cooked, moist with a crispy skin. 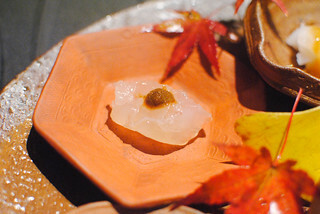 An accompanying mixture of chestnuts and chrysanthemum provided a cool and refreshing bite while a slice of peach, lightly pickled with ginger, was an interesting flavor combination. 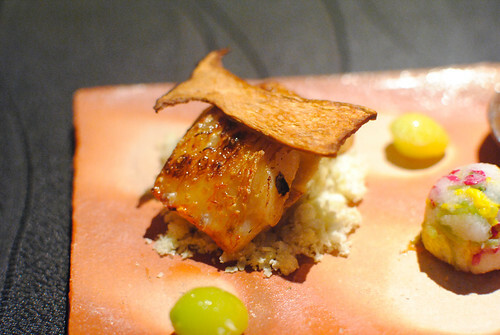 Here, octopus was paired with a still-raw fried scallop. 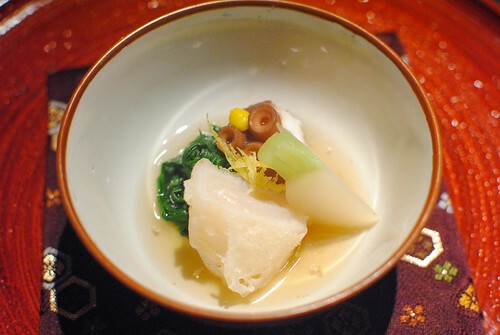 I liked the texture between the crispy scallop and slightly chewy octopus, paired with simmered spinach and turnips. This was also one of the most memorable dishes of the meal. This was my first time having eel in Japan and I was thoroughly impressed. 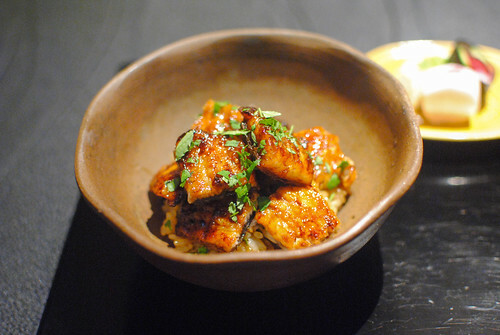 The eel was cooked in a way that it had a delightfully crispy skin, while keeping a juicy interior. Loved the texture and it was so delicious. It was served don-style, atop some brown rice. Lightly pickled egg, beans and a root vegetable sought to provide a slight acidity to counter the eel, while a shellfish-based miso soup was a wonderful finisher to the course. Following the last savory course of the meal, I was asked if I was still hungry; if so, the chef could prepare an additional course of either fresh soba or chicken rice (inspired by his time in China). I sort of misunderstood and ordered both…given the success of the meal at this point, I wasn’t going to reject anything coming out of the kitchen. The first “extra” was this one. 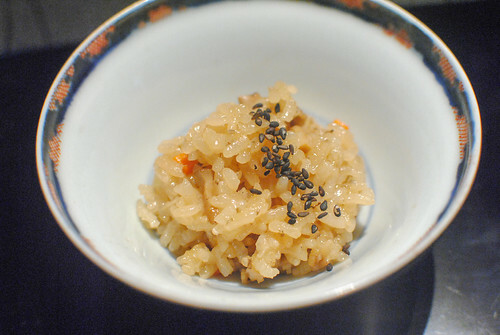 This is similar to a rice dish I eat every Thanksgiving and Christmas, a Chinese sticky rice (nuomi fan) with tiny diced mushrooms, carrots and chicken. I was told one of the sous chefs was making this fresh in the back. Soba is everywhere in Tokyo and I haven’t had a bad bowl (except the hit soup ones!) but I was very curious if RyuGin could elevate it. 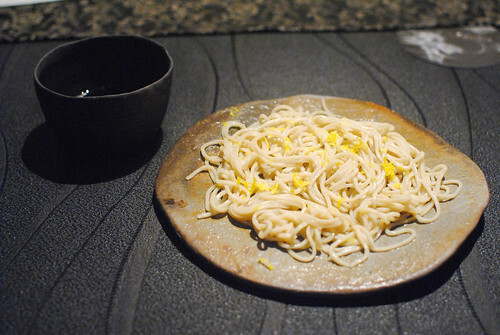 This was easily the best soba I’ve had so far with a superior, addicting chewy texture. The yuzu zest was a nice touch, but I didn’t really need it. The first dessert of the evening was this duo of grapes. The first was a grape imbued with CO2 (I think), which resembled champagne when it burst in the mouth. Pretty cool. 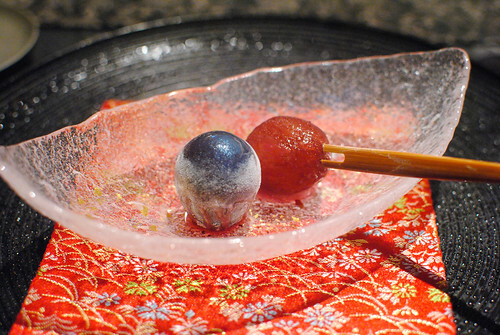 The second was a concoction frozen quickly via liquid nitrogen, cracked and topped with a grape jam. The interior of the grape had something like pop-rocks, leaving that familiar sensation in the mouth. The flavors were good, though I’m not a huge fan of the whole pop rocks sensation. 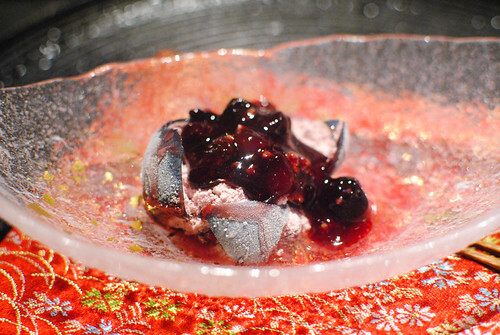 The final dish of the evening was this dessert, the chef’s take on a souffle-style oyaki. 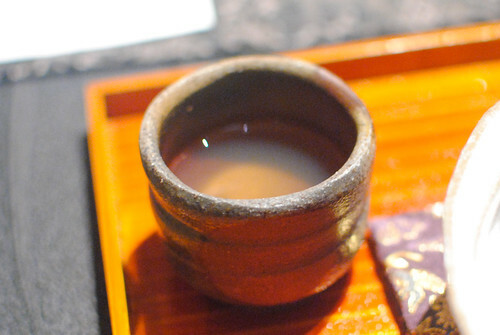 It was prepared with sake, which I could taste in each light and airy bite. A rich, eggy soft cream….kind of like a thick froyo, provided a sweet, creamy contrast. 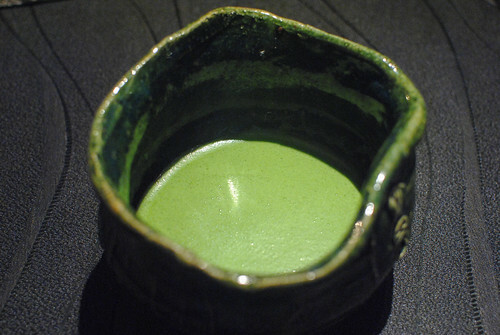 To pair with dessert I had a bowl of hot matcha. Bitter and slightly thick, I really enjoy this with dessert or as an end-of-meal drink. 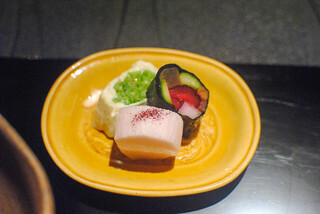 I had a nearly flawless meal at RyuGin, which lived up to the hype in my opinion. There wasn’t as much molecular gastronomy flair or “tricks” as I thought there would be, which I was actually pleased with. Instead, the preparations seemed to be relatively simple and straightforward, focusing on great ingredients and excellent execution. Service was impeccable, something almost always expected at a Michelin three-star, but it often fails to impress. Even though I still have a lot to eat in Tokyo, I think this will be close to (if not at) the top at the end – I may even drop in one more time before I go. Easily one of my best meals of 2012. I heard mixed opinions on Ryugin, but let me tell you that your review and photographs have seduced and I am looking forward to give it a try. Was it easy to book? My hotel conciege sounded confident, as opposed to, say, Sushi Saitou. Glad to have swayed you! It was relatively easy to book; you could even do it on your own. Haha yes, Saito is a whole different story..
Hi… I tried booking at Ryugin but was informed that I needed to book through the concierge of the hotel im planning to stay at. Unfortunately, the concierge at my hotel is unable to book Ryugin in particular for reason which remain unknown to me. You were able to book Ryugin on your own? I was. Sounds like they have changed their policy, though I’m curious as to why your hotel’s concierge isn’t able to make a reservation. Good luck!